We have tomatoes in every color of the rainbow. Try something new this year! and we have completely restocked our benches already. Tons of tomatoes, peppers, eggplants, basil, and lots more herbs arrived on Monday and Tuesday. We also received quite a few annual shipments already, with more plants to come as the week unfolds. As this crazy, intense retail season goes along, behind the scenes we also have 4 trucks out on the road every day, planting and mulching and doing garden maintenance. We are deep in the heart of container planting season for our clients and the plants are flying out of here every morning by the truckload. The lesson for you? If you see it, grab it. What we have changes every single day. Right now we have the best selection and greatest diversity of plants we will have all year long. The really amazing stuff sells out fast. A selection of our many pepper varieties. ‘Habanada’ is the most talked about variety. It has that Habanero flavor without the heat. This week looks like a mix of sun and rain. That makes our work a lot easier in one way- after we plant, if it rains, the plants get a deep soaking that watering with a hose can’t offer. Working in the rain isn’t that much fun, but with Memorial Day weekend coming up, we have no choice. Shopping in the rain, for our retail customers, is quite a trend this year. It’s actually useful to shop when you can’t plant and plant when the sun shines and the day is lovely. The drought is certainly over and we have a good reservoir of water in the soil. That is a situation that gives me great hope for this growing season. 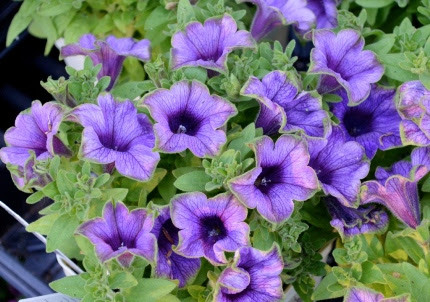 Check out this petunia ‘Picasso in Blue’. It has a subtle lime green edge. I just helped a customer pair it with green Nicotiana langsdorfiana, ‘Green Mist’ Ammi majus, and trailing Scaevola. I call this “playing with plants”. It’s like being an artist, only with living things! We Keep Posting so we can Keep YOU Posted! This week on Facebook Live we will talk about growing dill (among other things!) 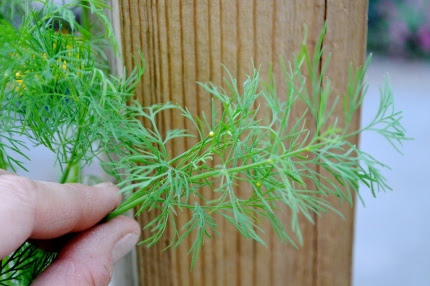 The dill above has teeny tiny swallowtail butterfly eggs on it. Can you spot them? 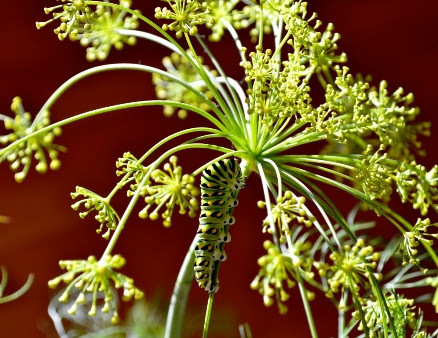 Dill is a very important larval food plant and easy to grow once you understand its unique needs. 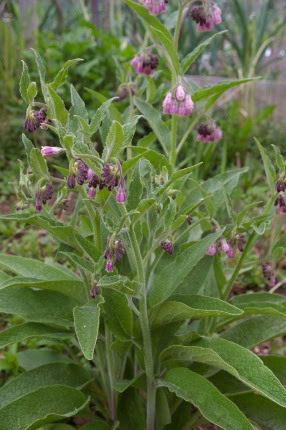 Do you grow comfrey? We grow it and harvest it for a mineral rich mulch for our veggie beds. Learn how and why on our Facebook Live broadcast this week at 5:30.
comfrey as a mulch for your gardens. Be sure to post your questions. I LOVE live questions! 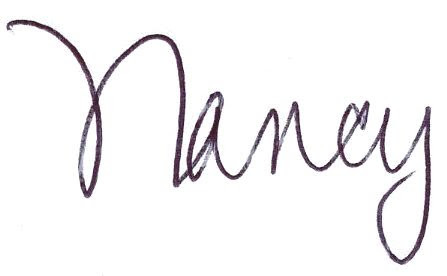 I so appreciate the fact that many of you are sharing our posts and videos with your friends. We are meeting many new gardeners and quite a few experienced gardeners that are new to Natureworks. Thank you for spreading the love! 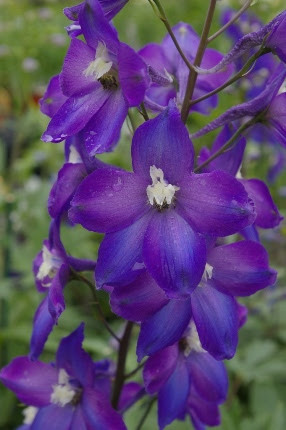 Delphiniums should be planted now for June and July blooms. The best plants of the year are on our benches this week. it rained, I picked a huge bouquet of ‘Red Charm’ peony flowers for my dining room table and a nosegay of lily of the valley for my office desk. Absolute heaven. The beautiful blue Campanulas (bell flowers) are sending up long spikes- these also make long lasting cut flowers. We have lupines galore, all in full bloom so you can pick your favorite colors. Perennial foxgloves are also in abundance on our benches. 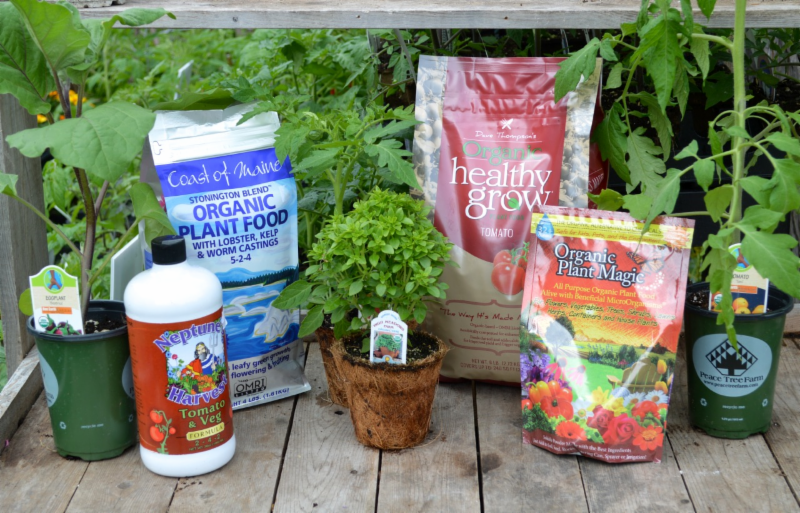 Keep your plants healthy and growing strong with our wonderful organic fertilizers. Digitalis grandiflora ‘Carillon’ is a nice dwarf, with buttery yellow spikes that don’t fall over, reaching about 24″ tall. 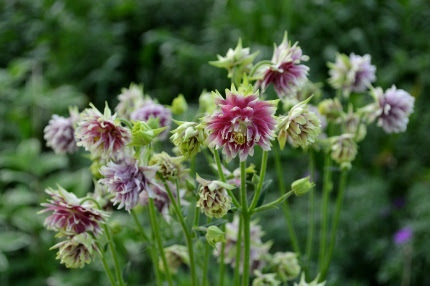 ‘Nora Barlow’ columbines have been growing in the Natureworks gardens for over 20 years. I have all of the plants in the nursery at my disposal, but what did I plant in my garden last weekend? Three columbines! 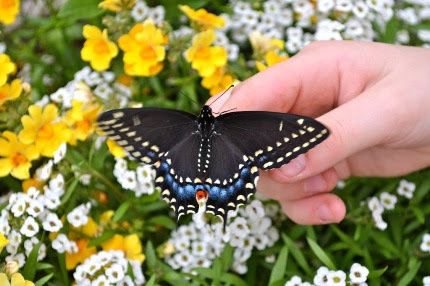 I have always loved them and I “dot them about” my gardens. Once they are done blooming, I always let them go to seed. Once the seed is dry and crunchy, I sprinkle it where I want to see plants next year. Thus my garden is always filled with delightful surprises. Yours can be too. And then there are the annuals, what I call the “frosting on the cake” of the garden. 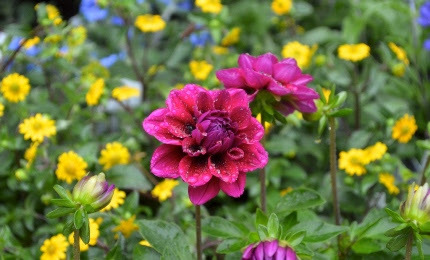 I tuck annuals in and amongst my perennials to either double the color or fill in a dull spot while waiting for a plant to come into bloom or after it has already flowered. 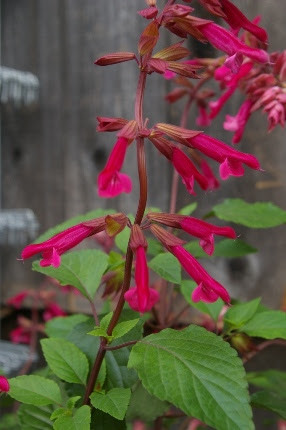 Calling all hummingbirds…Salvia ‘Wendy’s Wish’ is here! One of my favorites is Salvia ‘Wendy’s Wish’. 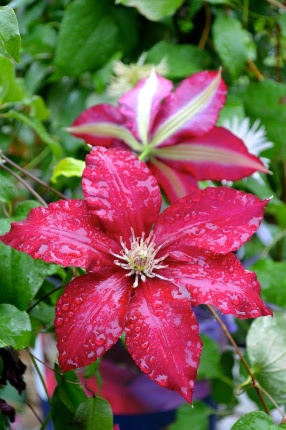 This grows 4-5′ tall and produces brilliant flowers that are adored by hummingbirds. 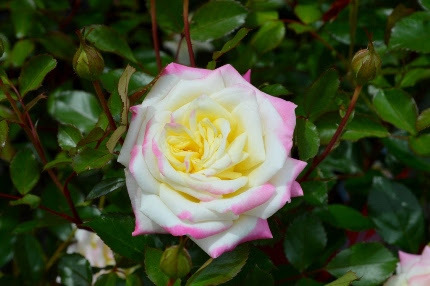 Weave this into the background of your garden and you will be astounded how much flower power it will offer, especially in August when you need it the most. 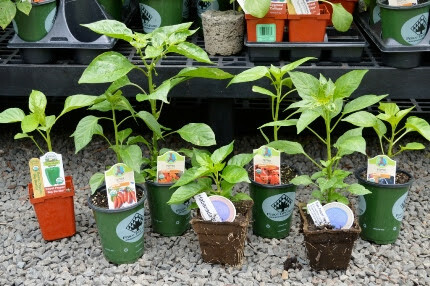 We have upright fuchsias, fragrant nicotianas, and a funky ‘Wild Orange’ cosmos that reaches 4-5′ tall. Unlike most of the other garden centers in CT, we are CLOSED on Memorial Day so that my dedicated, hard working staff can enjoy the holiday with their families. So get your shopping done by Sunday night. Stock up on everything you need from organic fertilizers, compost, veggies, herbs, annuals, perennials, roses, and so much more. Plant your patio pots. Deck your deck. 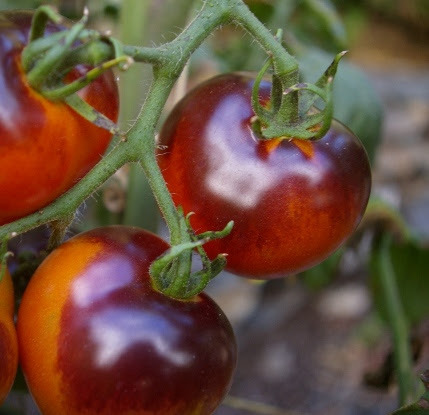 Join the rest of the folks who consider Memorial Day to be THE day to plant your tomatoes, peppers, and eggplants. Then you can sit back on Monday and enjoy the fruits of your labors. When Tuesday arrives, guess what, it will still be May and you can KEEP ON PLANTING… You know we surely will be doing that. It’s turning out to be a great spring for the garden. Make time to stop in this week.